To the attention of all soon-to-be married couples. Are you totally absorbed in the Big-day preparation works that no time is left for other important tasks such as finding a good way to document your wedding day? No worries! We have something special for you here – a nice and delicately looking template for your 4images photo gallery website. 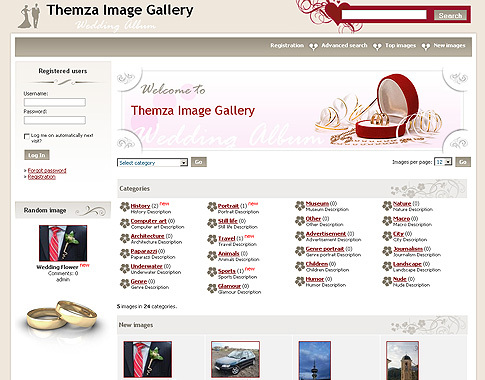 The newest 4images template that Themza has released so far bears the name Wedding Album and brings a whole world of magic and romance to your wedding-dedicated website/gallery. Transfer your festive emotions to the Internet through this eye-pleasing 4images theme and re-experience the never-to-be-forgotten event time and time again. Share your most precious wedding memories with people from the other end of the world who have not had the chance to be at the wed party. You can now perform a Wedding Album 4images template download from our website, by hitting the Download button, unpacking the template’s archive files into the “templates” folder of your 4images installation and selecting the theme from Settings-> General Settings-> Choose Template Directory in your 4images Gallery Admin Panel. This entry was posted on Monday, November 10th, 2008 at 11:01 am	and is filed under 4images. You can follow any responses to this entry through the RSS 2.0 feed. You can leave a response, or trackback from your own site.